Still reading. These "stories" all seem to be idea-driven. As in, "here's a cool idea, let's stick in some characters and a setting and call it a story". Also, I've decided the main character is the same person each time. Not sure I care enough to read more. Monissaw is still reading Despatches from the Frontier of the Female Mind, but I finished it last night with a cat sitting on me to keep me in place until the job got done. Well, okay, the cat was probably cold. Long before I became a feminist in any explicit way, I had turned from writing love stories about women in which women were losers, and adventure stories about men in which the men were winners, to writing adventure stories about a woman in which the woman won. It was one of the hardest things I ever did in my life. On the face of it, only LOTR and its companion volumes in mass like Jonathan Strange should take that long to write. What's the hold up, ladies? What's going on? 'A Sun in the Attic' by Mary Gentle struck me as an alternate history story, although it may be intended to be set on a different planet entirely. I felt a bit cheated by this story, as it opens with an apparent threat that turns out not to be a threat at all. But maybe that's the point. Maybe that's the trap the story intended me to fall into. If so, I fell. No denying it. Inside a framing story, wife and husband team Roslin and Gilvaris are looking for Del, who's also Roslin's husband and also Del's brother. This is a matriarchial society that practises polyandry. It turns out that Del has been dabbling in forbidden sciences and is trying to flee the country with his invention. For the good of everybody, however, his invention must be suppressed. This struck me as a bit odd when we have a 'barbarian' character (from a patriarchal society, natch) extolling the superiority of science while at the same time stating that Del's country has "put walls around the mind". Despite being anti-science, the country is scientifically advanced. Still, I suppose that's the current state of America, so it's not impossible. A thought-provoking story and probably worth a second read. Wife and husband team! I wrote husband and wife team first. So engrained are these conventions. 'From a Sinking Ship' by Lisa Tuttle irresistibly reminded me of HHGTTG and that Star Trek movie with the whales. Dolphins leave the dying Earth by means of aliens with whom they've been communicating. At the end, I said, aloud, 'So long and thanks for all the fish!'. The story postdates HHGTTG by a few years and predates the release of the Star Trek film by a mere year. Escaping dolphins must have been in the air. 'The Awakening' by Pearlie McNeill is a chilling near-future tale of a dying Earth in which the government has total control 'for the public good'. It's a patchy story that keeps making huge jumps in time, driving a bulldozer through unity of time with cheerful abandon. In that respect, it's bloody annoying. There's also a hint of somewhat cardboard characters, especially Nancy, the protagonist's daughter, who plays such roles as the story demands while consistency of character is bulldozed along with much else. Plot-driven would be the term. The ending however leaves you shuddering. Looked at from one angle, 'Words' by Naomi Mitchison has a valid premise. What if electrical stimulation of the brain could open up new ways to perceive the world? But when one character postulates, "But that led on to asking, were these the only sense synapses or were there others for some other sense we had never experienced? Cells that had never been animated, so to speak." we're deep in FTL territory. If you can't swallow the premise you can't swallow the story. Shame. Zoe Fairbairns' 'Relics' would be wasted on anyone who hasn't got a sense of humour, especially those unable to laugh at themselves. It's a fun romp through a post-apocalyptic world. No, really. Although I can't help feeling that the opening scene should have been cut as it has absolutely nothing to do with anything that happens next. Well, okay, it has its parallel in the post world, but I'm not sure it's strong enough for that scene to be given so much space. Have a laugh, anyway. With 'Mab' by Penny Casdagli, we're back in FTL territory. Or maybe it's meant to be funny. It made me uneasy, although the insights from the author's work with children are of interest. Raccoona Sheldon, aka James Tiptree, Jr, aka Alice Sheldon, has, in 'Morality Meat', written a story that's still topical. Perhaps even more so. In an America where abortion is illegal, we follow two congruent stories. That of Hagen, a trucker who has an accident while hauling meat to the rich men of the Bohemia Club North, and that of Maylene, forced by indigence to give up her baby daughter for adoption. Their stories come together in exactly the way the title leads you to expect. Painful. At times, the story feels a bit forced, and as if it really doesn't want the reader to miss The Point. As Sheldon is capable of writing much more subtly than this, I wonder if the constraints of space or the dictates of anger are to blame. It's a story that would be easy to dismiss on the grounds of 'preachiness'. After all, you can prove anything with fiction, as I'm fond of saying just before the book hits the wall. But Sheldon isn't a writer you can easily dismiss or ignore. Her simple, straight-forward prose has power. The last story in the anthology is 'Apples in Winter' by Sue Thomason. Only a few pages long, it's one of the strongest stories in the book. The characters, especially Maia, leap off the page. It's a story of love and culture clash. Of jealousy and difference and pain. Definitely worth a read. We can't afford to forget books like this. We can't afford to lose our heritage once again. I made a start on the current book from the Mistressworks list, Despatches From the Frontier of the Female Mind, but now seem to have ground to a halt. It's been a difficult few days, one way or another, and I've been more interested in comfort reading, if I'm honest. Today wasn't a day on which I could get any serious reading done at all. If I mention cars and garages, perhaps that's sufficient explanation. 'Instructions for Exiting This Building' by Pamela Zoline. Eight stories down with nine to go. It feels surprising that there are so many stories in such a small book--a pocket-sized paperback. Although the font is quite small. I've also been trying to peel the sticky label off the back, but it doesn't want to come cleanly. I hate labels on my books. 'Big Operation on Altair Three' didn't gel for me. It has the feel more of notes for a story than of a story that's been completed. The big reveal doesn't have the impact that it should have. The premise is shocking enough in theory: a woman having a hysterectomy in order to advertise the superiority of a car's suspension. But the story doesn't have the chops to pull it off, somehow. It feels flat. The ending trails off into nothing and it's over. And...? That's the feeling I was left with. And...? 'Spinning the Green' is a meta story from before the meta story was supposed to have been invented. It's possibly more fun to try to trace the sources drawn upon than to follow the actual plot. My mind started running happily on Reeling and Writhing and Fainting in Coils. Anyway, what is the plot? It's a sort of mash-up of Tam Lin and Beauty and the Beast, except there is no Beast. It's an allegory, stoopid. 'The Cliches From Outer Space' was probably terribly witty and apposite when it was written, but it has dated badly. Russ pokes wicked fun at various storylines that are not unfamiliar to those of us who've been reading genre for more years than we care to admit, but it's all been done since. If you're coming to this now, you'll think it's tired ground being retrodden. If you'd come to it in the eighties, it'd probably have leapt off the page and slapped you in the face. But it's vintage Russ. She's there, talking to you. 'The Intersection' drowns in abbreviations and acronyms, and it's explainy. That's all. 'Long Shift' is a solid tech story where telekinesis has been identified and harnessed. It intrigued and drew me in. The downbeat ending feels right, especially as it's presented in a curiously upbeat way. Probably a story that should be better known than it is. Tanith Lee's 'Love Alter's is easily the best story so far. It's well written and the premise grabs. In a predominantly homosexual society, where all that sordid heterosexuality has been left behind, a woman falls in love...with a man. Beautifully observed and told with just the right mixture of self-knowledge and wilful denial. Score. 'Cyclops' is, sadly, the sort of story that I dislike, whoever's writing it. So it lost out in my estimation through no fault of its own. The premise is sffy enough: a fugitive has proof that Earth was not the birthplace of...here I always stick. Humankind? Humanity? Earthlings? Well, whatever. The proof offered is sufficiently arcane to make the reader think. But here's the thing: it 'explains' something from mythology. It's a bit like all those time-travel stories that 'explain' past events, or even past people. Do not like. Personal quirk. Nothing to be done. 'Instructions for Exiting this Building in Case of Fire' is a difficult and disturbing story that also deserves wider recognition than it's had. A group decides to combat indifference to, well, I suppose these days we'd say globalisation, climate change, capitalism, etc, by kidnapping children and relocating them in areas likely to be affected by the aforesaid. It's deeply strange but never convinced me this would actuallly work. Worth a read, though. If Bradbury had written it, I'd have heard of it before. So far, so mixed. Definite recommended reads are 'Love Alters', which is really beautifully done, and 'Instructions for Exiting this Building in Case of Fire', which you should damn well read because it's right up there with the darkest visions of the future. My copy arrived today in a grey plastic wrapper. It is a small book, smaller than I expected. The text is also small. I'm guessing the Women's Press's budget was not large. The book is inscribed, 'To Katie, for your birthday! With lots of love from Jane xxxx' and at the top of that page is written 'Leeds 1989'. How the book got from Leeds to Berkshire, whence it was shipped to me, is a mystery. As of course are the identities of Katie and Jane. It's nice though when books come with a history. 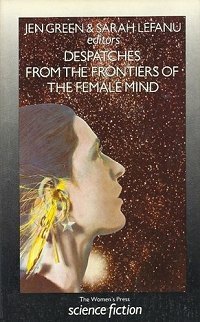 "Despatches From The Frontiers Of The Female Mind" is the next book we're reading from the Mistressworks list. Marvels, myth and microchips from classic writers of science fiction, and a dazzling array of new authors. From far-flung planets to Greenham Common, from distant futures to the here and now, the stories explore the myriad possibilities of women’s lives: women under attack, women in control, women alone and women together. With stories set in societies barely recognisable, and societies only too credible, this collection comes from the frontiers and offers a glimpse of what lies beyond. We used the randomising powers of GameBot to select the next book. From a list of 90 books, 89 of which are novels and 1 of which is an anthology of short stories, he picked the anthology. The lucky book is Despatches from the Frontier of the Female Mind, edited by Jen Green and Sarah LeFanu and published by the Women's Press. Like so many of the Mistressworks books, it's out of print, so recourse was had to secondhand marketplaces Alibris and Blackwell. The same three UK sellers popped up in both locations, but the book was cheaper on Blackwell by a few pennies. So my order was placed. Monissaw decided to go local and get a shorter shipping time. In view of what happened last time I bought books for her from Alibris, this can only have been a sensible decision. Some of these names are familiar. Others are not. Tanith Lee is shortly to receive a Lifetime Achievement Award at the World Fantasy Convention. Joanna Russ needs no introduction. Should be an interesting read.